I went into the Winter Retreat with expectation. I wasn’t sure what exactly I wanted, I just knew I wanted something and I did receive. On Sunday night, while we were worshiping, the Holy Spirit just fell on us during worship. I don’t even know how to describe what I was feeling at the time, but I could not stop crying and crying; just thinking back to it would bring back tears. All I knew in that moment was that I never wanted to leave, and I never wanted to go back to how things were before. 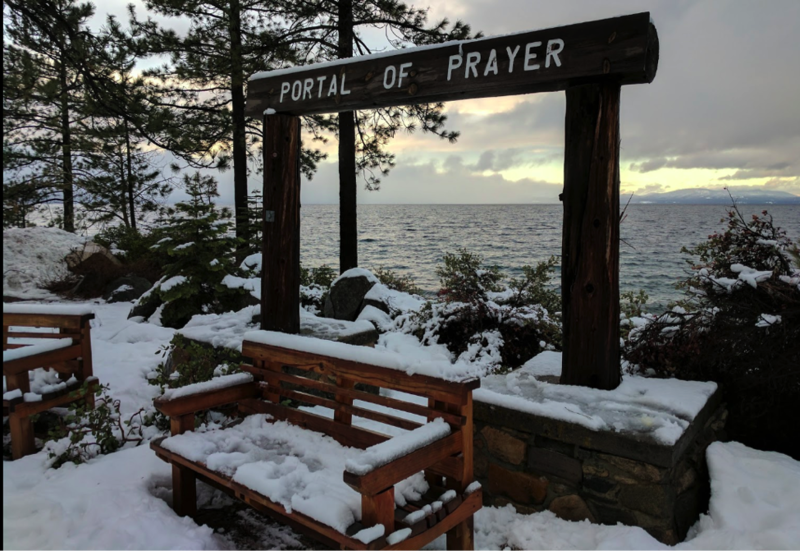 When I was kneeling on the floor crying, I remember myself asking, “Why can’t it be like this all the time?” and “Why can’t I experience God like this every day of my life?” I realized that part of the reason why we experienced God so powerfully was because we were dedicating our time at Lake Tahoe to Him. We specifically set apart this time to grow closer to God and to grow spiritually, and if just three days dedicated to Jesus let us experience God so powerfully, just what would God have planned for us if we dedicated our whole life to Him? From the sessions we learned about the sacrifices we have to make if we want to follow Jesus. I feel like God has really been telling me to live my life for Him, to put Him above everything else, and to cut off certain things from my life, and to just obey. Before the Youth Winter Retreat, my relationship with God was very weak. In all honesty, I wasn’t spending Time With Abba, usually just singing a few songs on guitar, reading the Scriptures or writing down the most basic things that just stood out to me or God’s characteristics when I did decide to do it. My prayers were all the same, the basic “Thank you for the food and for family, etc.” I had the yearning for God and desire to have a deep relationship with Him, but I never did anything to make it happen. I remember writing in my journal multiple times about how I was always so distracted by other things, putting homework, video games, or anime above God. Once I made a promise to myself that I would dedicate time for Him everyday after school instead of taking a nap like I always did. At first, it was amazing and I was really receiving things, but the time I dedicated quickly grew shorter and shorter until it stopped altogether. The only times that I truly felt a connection to Him was a few times when I was playing guitar and singing. In the youth’s Prayer Frontline team, we had been praying for transformation before the Winter Retreat–not just a spiritual high that we come down from to live our lives normally after, but a permanent change in us, and so far, it has come true for me. After Pastor Elliott told us to literally throw everything that I put before God away, I got on my phone and deleted a couple apps that I had been spending far too much time on, and reserved that time for God instead. I am almost always thinking about God and what He’s done when I’m not actively doing something, and I’ve found myself a lot more joyful and carefree rather than tired, bored, and a little bit stressed. I create time for TWA, and instead of going on my phone before I fall asleep, I soak in God’s presence and pray in bed every day. I dedicate that time for Him, and one time, I think I felt God’s shekinah presence there, when I was just laying in bed. The song “God, you’re so good” has been playing on repeat after my YouTube autoplay suggested it during homework, and so I’ve been singing it in my mind to God, and I just pictured His arms encircling me, embracing me in a hug, and I felt his love pour out on me so much that I started crying and crying, and I could not stop. For my entire life, even up till now, I have struggled with self-criticism. Even the tiniest little things that I do wrong I would feel so bad about, and a lot of times I would reflect on it and feel even more horrible. In softball, it’s even worse because I know that one error on my part affects the entire team. The longer we are on the field playing defense, the more our pitcher has to pitch, and the more downhearted the team gets. It doesn’t help that we have a new Coach that is slightly more strict than the last one. During my first pre-season game, I made an error on an easy ground ball coming my way, then another right after on a pop-fly. I already beat myself up over it so much, but when the Coach went up to the pitcher’s mound to specifically address my errors, I felt even more horrible. Back in the dugout, I tried to hide the tears (yes, I tend to cry extremely easily) from my team as I kept telling myself that I should have done better, that they were such easy plays to make, but then my thoughts turned to God and how He’s always there for me and He loves me no matter what. Even with these thoughts, however, my crying continued, and I still felt horrible about my mistakes, but when it was our turn to take the field again, the instant I stepped out of the dugout, my tears stopped and my mentality made a complete turnaround from “I should have done better,” to “I can do this.” It was truly God’s strength lifting me up and supporting me when I wasn’t strong enough myself. The phrase “The Lord is my strength” used to be such a cliche and overused phrase for me, but now I find truth and comfort in it. I’ve learned that the more you seek God, the more He will appear to you. This has really been a truth for me recently, and I really hope this passion for Him never dies down. I truly believe He is calling me to live my life for Him, but I’m not sure what exactly He has planned for me yet. I guess what I wanted to share is to put God above everything else and to devote yourself to Him fully. When you set yourself apart for Him, I found that He does reveal Himself to you, and there is no other place I would want to be than in the presence and favor of God.